To finish off the seasonal posts I would like to share with you some interesting things that I acquired for Christmas. It seems that I get just as much pleasure from the little things as I do from the big ones. The item below came in my stocking. 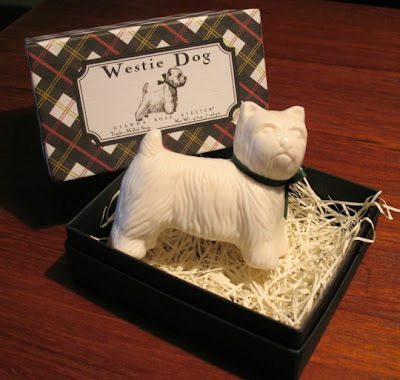 A Westie soap. Now how can I use this? Impossible! The mailman brought me this today. 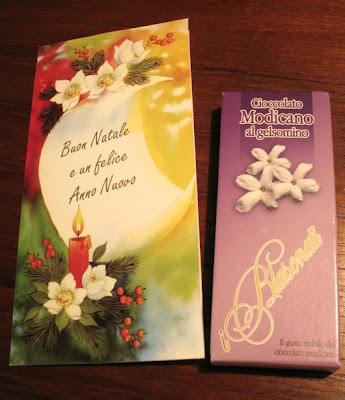 A Christmas card and some of that special chocolate that Modica, Sicily is so famous for. Yes, from Welshcakes. Thank you for the lovely surprise Welshcakes, a little after Christmas, but you know the Italian Post Office. Pazienza! Well it could have been the Canadian one for they surely require Pazienza too sometimes. 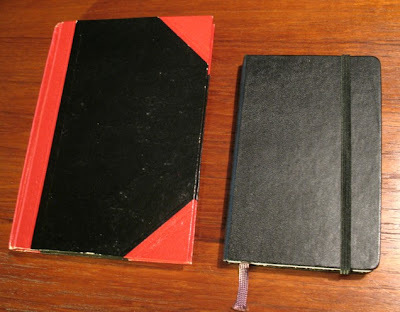 On the right is a Moleskine Notebook, put into my stocking by my daughter to replace the ordinary but colourful notebook I normally carry, shown on the left. She saw me looking in the notebooks one time at Barnes and Noble and lamenting that mine did not have an elastic closure which is so useful. So ta-da! Now I have one. The Moleskine Notebook has a history to go with it, of course, which is held in a little pocket in the back of the book and paraphrased in part here. Originally produced by small French bookbinders and sold in Parisian stationery shops, the notebooks were used by artists such as Van Gogh and Picasso as well as by writers like Ernest Hemingway and Bruce Chatwin for sketches, stories, notes and ideas. The last French ones were produced in 1986 and Chatwin, an English novelist and travel writer, who had ordered 100 of them, bought up all that he could find. 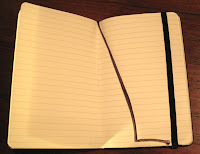 In 1998, a small Milanese publisher brought Moleskine notebooks back again, with many different interior styles. The pages are printed in China now but they are still bound in Italy. Each notebook is handmade and carries its own quality control number, mine is 7542 and is the original famous design. There will be little sketches in mine, as well as notes on things I see and places I go and talks I hear. No resemblance to Picasso’s or Hemingway’s notebooks, just things that interest me and I want to remember. Do you think I should ask for 99 more?